Preheat oven to 350 F. Thaw flounder per instructions and pat dry with paper towels. Place the fish fillets in a single layer in a 13 x 9 x 2 inch baking pan. Sprinkle with 1/4 teaspoon salt. Drizzle with 2 teaspoons oil. Bake for 8 to 10 minutes for flounder or until the fish flakes easily when tested with a fork. 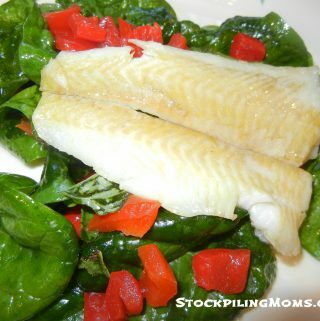 Toss the fresh spinach together with the roasted red peppers, fresh basil, lemon juice and olive oil. (I like to do this 30 minutes before I bake the fish and chill). Place on the plate and top with the baked flounder.